dayspamagazine.com | SEPTEMBER 2016 65 crucial credential. "When a person is positive it radiates off them; I can sense that they love to engage with oth- ers and have a desire to be a part of the big picture," continues Johnson. "My goal operationally is to ease resistance so we're all moving and fl owing together. It refl ects in the guest experience—when I say big picture, that's what I'm referencing." Here, staffers aren't merely employees, or even team members—they're "internal guests." "Training is quite a process," says Johnson. "It includes an in-depth introduction not only to the property itself but to Omni culture; when I bring in therapists, front desk and locker room attendants, we give them an opportunity to understand the overall experience from the guest's perspective. They learn about products, treatments and operations." This strategy is clearly working: Johnson cites internal guests who've been with La Costa for 20, 30, even 40 years. Loyalty works both ways: Although overnight guests make up the lion's share—around 75%—of spa guests, locals fl ock here too, especially to celebrate special occasions on the lush private patios. A new spa menu was unveiled last December, and the spa veteran has some additional tricks up her sleeve, such as the introduction of monthly, rather than seasonal, specials. "If a guest doesn't like that parti- cular season they're out of luck until the next one," she reasons. The resort's "incredible and spontaneous" marketing team also plays a role. Other endeavors in- clude the use of a texting service: "Maybe it's a Monday or Tuesday morning and we're throwing in a compli- mentary add-on; it's fun to have the text sent out and watch the response," says Johnson. But she also knows what not to change. Perhaps surprisingly, she never starts a new job with an agenda, but rather looks to bolster elements that already work. "This spa has such heart to it, so I'm really looking at that and trying to create forward movement that em- bodies it," says Johnson. "That's what I look to do—to enhance and focus on the positive things happening." 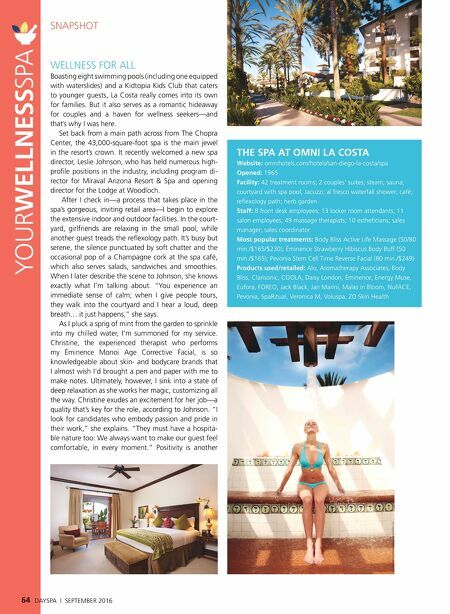 Given the resort's bustling spa and weekly chang- ing activity menu, its key strengths are clearly wellness and fi tness. "My passion is overseeing lifestyle pro- gramming. I thrive on creating environments that allow people to get to know themselves in different ways," explains Johnson, adding that she's working on "fun, different" options, as well as more typical fare such as themed morning wellness packages based around yoga, aqua and the like. "I'll continue to enhance the market segment that comes to the resort for wellness, because I believe this property has so much wonder and wonderfulness to it," she concludes. In other words, that intangible La Costa charm. Lesley McCave is DAYSPA's executive editor.